The Zuiderdam clearing the Miraflores Locks - Panama Canal The Zuiderdam is a cruise ship owned and operated by the Holland America Line. 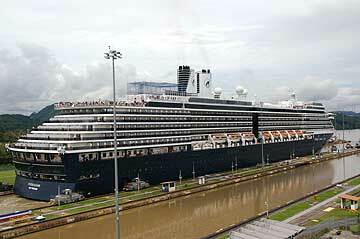 The ms Zuiderdam began her inaugural season in 2002 as the first ship in our Vista-class series. She embraces the latest industry and environmental technologies such as her use of a diesel-electric power plant for optimal energy efficiency and an Azipod propulsion system. Forward-looking in both design and spirit, the ms Zuiderdam was also the first ship to offer data ports in every stateroom for Internet and email access. 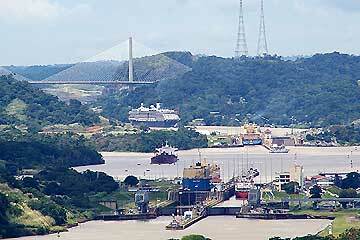 The Zuiderdam does many Mediterranean Cruises as well as visiting far away destinations like the Panama Canal. 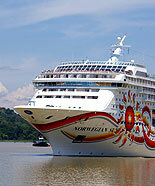 It is the first of the Vista Class ships, so named for the extensive use of glass in their superstructure. 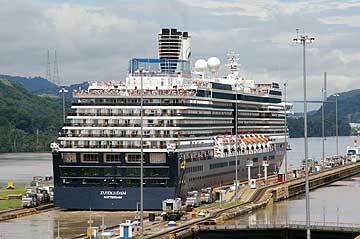 It is sister to the ms Oosterdam, ms Westerdam, and the new ms Noordam. The names of the four ships translate to the four directions of the compass in Dutch.